Before Terence Zelman started at Shell as a Pump Shop Supervisor, he dreamed of having a better work-life balance and a safer working environment. What he’s experienced since joining the team has been all that—and so much more. Teresa shares how she is creating her life’s work through a non-traditional career that empowers her to make an impact. Learn how Shell’s unique community has helped Theresa prioritize both her career and motherhood. An inclusive workplace brings out the best in our people. We’re proud to introduce our new global standard for maternity leave, and expanded benefits in Canada for all parents. Discover remarkable opportunities at Shell – opportunities for your ideas to travel, for you to excel in a global company, and to shape the future of the energy industry. Instrumental music with strings, increasing in rhythm and intensity, then gentling towards the end. Fast motion footage including a busy city intersection by night, low angle view of tall city buildings by night with vehicle lights streaking by in the foreground, a pedestrian bridge teeming with people seen against the lights of buildings and vehicles streaking past below, a city sidewalk bustling with pedestrians, and a wide bird’s eye view of a glittering city skyline by night seen beneath dark blue skies. The screen splits into two. The upper part of the split screen shows an aerial view of the darkened outline of oil platforms seen against a dark ocean, cutting to a panning bird’s eye view of a platform by night, seen against the background of dark seas and skies, and finally to point of view footage as from the platform, showing platform structures in the foreground and, in the background, dark blue seas visible to the horizon. The lower half of the split screen shows footage of three people engaged in discussion against the background of an office environment, cutting to rear view footage of people seated at desks, facing the front of the room where an instructor is standing in front of a large screen while addressing those seated, and finally to high angle footage of people seated around a table in an office environment, engaged in discussion. Mid-view in profile of a man dressed in white lab coat, safety gloves and glasses, seated at a work station in a lab environment, with his head bent over tests he is conducting. Fast motion low-angle footage of a Shell service station seen against the background of a cloudy blue sky, with vehicles seen rapidly pulling into and out of the petrol pump area. Low angle footage of two men dressed in safety gear at a work site and seen against the background of a blue sky, engaged in discussion as the one man points to plans spread out in front of them. This cuts to a close-up of the plans to which he is gesturing. Mid-view footage of two men dressed in safety gear shaking hands against the background of a plant and cloudy, pale skies. Mid-view in profile of a woman speaking into a headset, seen against the background of upper floor windows through which a section of the city can be seen below. Panning aerial view of people teeming on a racetrack alongside the stands, cutting to rear view footage of a race car rounding a corner of a race track. Bird’s eye footage of the Thames and London in the evening light, the London Eye at frame-left. Footage of a man dressed in overalls seated at a long, curved stretch of controls, keyboards and screens. Point of view footage as from a platform, showing platform structures in the foreground and, in the background, dark blue seas visible to the horizon. A helicopter can be seen against the cloudy skies, slowly nearing and descending towards the platform. Wide view of the helicopter landed on the helipad of a platform, blades still spinning, showing the passengers disembarking. Close-up of a finger flipping a red switch marked “Power” to the on position. Bird’s eye view of a multi-storey building by night as the lights flicker on and off in numerous windows. Wide bird’s eye view of a city by night, tall sky scrapers and buildings lighting up the night sky. Wide bird’s eye view of a line of wind turbines stationed in the ocean, a vessel visible in the ocean below the nearest turbine. Mid-view in profile of a woman seated at a workstation in an office environment, facing her computer screens as she moves the mouse with her right hand. Mid-view of two men seated at a work station, engaged in discussion, one pointing to the computer screen in front of them. Mid-view of two people in a darkened room wearing VR headsets, the young man reaching out in front of him with his hand. Close-up of a pair of hands moving across an image projected on a large screen, pulling back to a wide view of the individual standing in front of the screen with the projected image, while the backs of several heads are visible in close-up in the foreground. Mid view of two people wearing safety hats standing alongside a white board, at frame-left, and engaged in discussion. Close-up of a man seated amongst colleagues, smiling. Mid view of colleagues seated around a lunch table, as a man standing in the foreground reaches across the table to shake the hand of a smiling woman. More footage of two colleagues smiling as they talk together over coffee. Close-up of a seated man dressed in a white lab coat giving the thumbs up signal, with another man dressed in a white lab coat seen standing behind him. Satellite view of the sun rising over the partially-lit rotating earth. Close-up of a woman wearing a VR headset, images reflected in the two lenses. Rear view footage of a woman standing behind a computer screen which reflects the image that was previously reflected in the other woman’s VR headset lenses. The same image is also projected onto a large screen at the front of the room, and people seated in the audience between are seen to have VR headsets on. Mid-view of a woman dressed in safety hat and gear, her attention on the clipboard in her hands, and seen against the background of plant or platform structures. Rear view footage of a man dressed in safety gear standing on an elevated platform, looking across an expanse of buildings and tanks towards the setting sun in the distance. Close-up of a darkened figure walking towards the shot; a glass door opens on which the Shell Pecten is displayed, and the figure passes through. Low angle close-up of a group of young people standing bent over a project in the foreground, their faces reflecting expressions of awe and excitement. Pan down on the white tiled background, three vision panels display, one larger landscape and two smaller squares. The large panel shows a woman riding a bicycle. This is followed by a wide view of a worker at a refinery, followed by a woman walking in front of the London Eye. A laboratory setting. Two technicians wearing white coats are in discussion. One is sitting, one standing. A glove hand holding a pipette drops liquid into small round compartment in a tray. An equipment part rotates. An office environment. Three co-workers sit in discussion, one makes notes. A smiling woman seated at a desk shakes the hand proffered to her. Two seated co-workers share a smile. Against a white tiled background, three video footage panels, one larger landscape and two smaller squares. The large panel shows a cityscape at night-time. In an office environment, a group of graduate trainees sit around a table in a meeting, they look at a screen. Outside, against the backdrop of a derrick, a graduate consults with a co-worker. Their fingers point to a line on a graph. In an office environment, an employee sits at a bank of screens talking to a graduate co-worker wearing a hard hat who is standing to his side. Outside at a refinery, two co-workers wearing blue overalls stand on a metal stairwell against a blue sky, followed by a close up of the men talking together. Close up of Grace laughing followed by Nick presenting against a brightly-coloured screen. In the lab, a seated technician places a test tube in a container. Close up of concentration of bubbles in a clear liquid. Exterior view of a tall structure with solar panels against a blue sky, followed by the reflection of the structure in the solar panels. A refinery worker in red overalls admires the sunset from an elevated level. Discover what you can achieve at Shell. 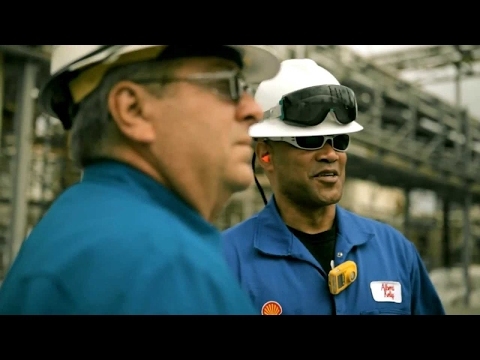 A video with Shell employee perspectives of his work experience at a Refinery. Features Chris Justin in various office and plant settings in and around the refinery – looking at computer screens and reporting, discussing issues with colleagues and experts, walking around monitoring situations and even in recreational activities outside of the workplace. A process engineer is essentially a doctor for a refining unit. You come in and every single day, you perform a check-up. You take a look at your computer screens; you look at your pressures, your temperatures, your flow rates and you make sure that everything’s in order. I’m a member of the enhanced problem-solving team and on that team, we take long-standing issues and we try and work them through. You essentially get to sit in a room with experts from all different disciplines. You are given a general problem and you sit down together and say, “Well, how do I fix this?” – which is a lot of fun. Safety is at the foremost of my mind when solving a problem. You know that decisions that you make will have an impact on not just peoples’ livelihoods but peoples’ lives. Every single day that I come in that I don’t understand a problem, I’m able to talk to some expert to find a better understanding of how things work. That’s a great feeling. I think Shell does an extremely good job at allowing people to discover their strengths. Coming out of school you learn how to solve problems but you don’t really know what engineering is and being at a site – being at a refinery – you really learn that hands-on. New Orleans is a very welcoming city and everyone just brings you into their family pretty much immediately. I’ve got a ton of great friends in New Orleans now. My name is Chris Justin. I’m a Process Engineer for Shell at Norco, Louisiana. A video with a former veteran and Shell employee who shares his perspectives on career opportunities and progression at Shell. Features Albert Kelly driving, close-up speaking to the interviewer, taking a phone call, conducting meetings and in various office and plant settings in and around the plant. Towards the end of the videos are beautiful outdoor and park and recreational scenes around New Orleans. …and make sure that they’re doing what we expect them to do. I was in the Marines for eight years and you would not survive if you didn’t have teamwork. You have to develop management skills so that the people working under you are held accountable and that they’re responsible and they have the right training to understand what they need to do to get their job done. …To keep this equipment running, and to keep the refinery up. …Now I can manage my own career. I can actually decide where I want to go next, and how I’m going to get there. I have probably 300 to 400 guys that report to me on a daily basis. I want everybody that comes to work to be happy. I want you to come to work to say “I love doing this job.” I do that every day. Family life in New Orleans is great. My kids love it – they wouldn’t have it any other way. That’s a good feeling. My name is Albert Kelly. I’m a Maintenance Execution Manager at Shell Norco near New Orleans. At Shell we take your career to greater heights. Join us and you will work with the best minds, fast track your learning curve, shape your own career path and propel your career. 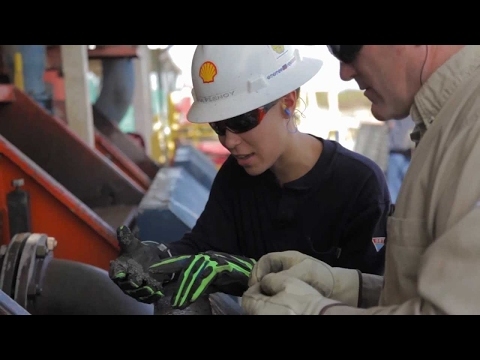 This video highlights six global talented Shell technologists and engineers whose "never-more-of-the-same" careers benefit from Shell's industry leading development programme. Watch a Drilling Engineer talk about her escalating learning curve with her first rig within the first year of her joining Shell, and listen to our Ferrari Technology Manager talk about her specific product knowledge for Formula 1 racing cars. Their expertise and ideas resonate on a local, cross-regional and international level. Join Shell, watch your idea travel and change the game for energy globally. Opens with scenes approaching a drilling rig, people driving, employees walking outside at a plant, Ana Flenoy speaking in an office, working around plants; employee walking in an office lobby and speaking to the camera, looking at visual data and speaking on the phone, backdrop with Formula 1 and Ferrari, employee talking to the camera, research and development, other employees talking and working with others; geologists and geophysicists meeting, other employees meeting and working in a variety of work settings. 0:12 I would never have said oil and gas. 0:16 they'll be parallel. - Oh, really? 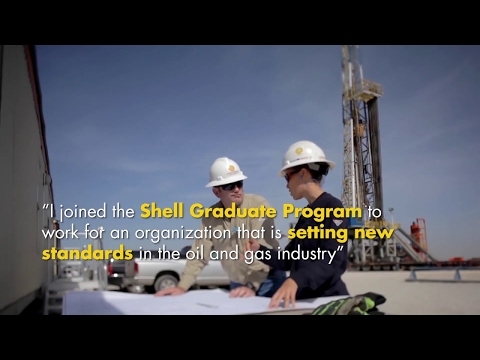 0:18 Shell is looking for future leaders. 0:21 I like this statement. 0:32 that we provide to the Ferrari Formula 1 team. 0:34 This is the GTL 4, meaning four centistokes at 100 degrees C.
0:43 and in stuff that really matters. 0:45 This is the flow line, where oil flows. 0:51 that actually look at the earth and tell us whether this could be an area of interest. 0:59 the added value that Shell can bring to a country. 1:07 through working together as part of a larger team. 1:15 without that wide variety of multidisciplinary skills. 1:19 I can go out and actually experience the real deal. 1:25 to make sure that they're operating to how you design it to be. 1:29 These are for the particular controllers, right? 1:35 to get more oil and gas from the well. 1:46 and it's Shell's responsibility to do this in the most efficient way. 1:54 in one of the most technically challenging engineering environments in the world. 2:03 the V-Powers, the Shell Helix oils and fuels - that everyday customers get to use. 2:07 It gives you a sense that you can make a difference. 2:10 Your work is actually creating an impact. 2:20 and then maximise on your capabilities and share it with others. 2:24 I was given a rig within my first three months of working at Shell. 2:27 Of course, I had my mentors there with me. 2:31 It helps you grow very quickly. 2:33 Your learning curve just escalates like you would not imagine. 2:37 I have a company that are working on those plans right now. 2:40 If you're proactive about your development, you can just go anywhere. 2:46 Shell will definitely give you the opportunity to deliver on that and expand further. 2:52 You have a global network. 2:58 and I could pick up the phone and, you know, figure out whatever I need to. 3:05 You do not need to depend on a certain region for that knowledge and experience. 3:09 It's just at your fingertips. You can get it at any time. 3:13 I meet new people every day. 3:15 Every day is another excitement, another new challenge. 3:18 I look forward to tomorrow. 3:22 I'm a Subsea Controls Engineer. 3:25 I am Zhu Changlong. 3:28 My job title is Production Technologist. 3:33 My name is Cara Tredget. 3:34 And I am Shell's Ferrari Technology Manager. 3:39 My name is Marc van Rooijen. 3:42 And I work as a Senior Commercial Advisor in floating LNG. 3:47 My name is Mohammed Al Rayahi. 3:50 And I'm a Rotating Equipment Engineer. 3:53 My name is Ana Flenoy and I'm a Drilling Engineer. 3:58 When I tell people what I do, they don't believe me. 4:00 But it's fun. I love it.